Steve Tilston is acknowledged as one of folk music's finest guitarists as well as being an outstanding singer/ songwriter. He has been performing and touring regularly worldwide since the mid-1960s and has made a host of critically and publicly-lauded albums during the period. His work has been likened most particularly to that of other English performers of his generation, Nick Drake and John Martyn. Steve made his recording debut in 1971 with An Acoustic Confusion and followed this with a series of releases through the 70s and the early 80s. 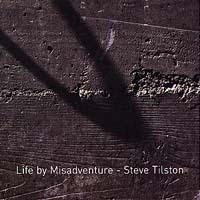 Life By Misadventure was first released in 1987 on the Run River label. Says Steve: "The opener, These Days, was very much an anti-Thatcherite song. I felt that this period in Britain was marked by a few doing very nicely thank you, but far too many who were not." "There are a quite a few personal songs on the album too, including Here Comes The Night, which I still play today and is very popular in the clubs. Sometimes In This Life is my secular hit, my celebration of life." The album marked a departure from Steve's usual and noted role as an outstanding singer/songwriter to focus on his equally extraordinary gifts as arranger and multi-instrumentalist. This wholly instrumental Celtic suite is a beautiful work from start to finish, evoking traditionalism yet at the same time picking up on classical and new age influences along the way.